We are a registered MCS approved company, providing the highest quality, energy efficient and environmentally responsible products. We provide a fully managed service is provided â€“ a one stop solution from concept to completion, which has been proven to add value to your property, as well as producing sustainable energy performance and efficiency that will be enjoyed for years to come. PV solar panels generate electricity from the sunâ€™s energy rather than just heating your water. Traditionally, youâ€™re more likely to see these on offices or large developments than on homes, however the Feed-In Tariff is encouraging more and more people to utilise their roof space for solar PV. Solar thermal panels fitted to your roof heat water for use around the home, they are the ones most commonly seen on homes and buildings around the UK. 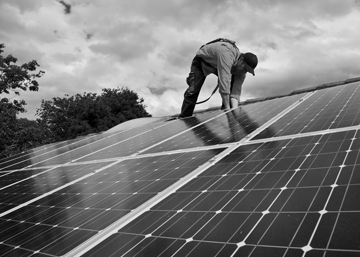 An average household can save about 50% of the annual cost of hot water using solar panels. Heat pumps new to the UK they have been utilised in Scandinavian countries for years. They offer a very effective way of reducing your heating costs, every 1kW that you spend on electricity, the pump will generate between 3 to 5kW of heat (essentially it is 300-500% efficient). This is impressive given that most modern high-efficiency boilers have an efficiency of around 95% i.e. for every 1kW of input your return is .95kW. We have a fully operational renewable energy showroom which shows PV thermal solar, air source heat pump and underfloor heating at work. Contact us to arrange a demonstration of how this new technology works and how it could benefit you. For more information about our renewable energy solutions in Essex, please have a look at our FAQ page, or give us a call on 01702 619698, we would be happy to answer any queries. "I would like to say many thanks for the recent work carried out on my property, the lads were very considerate with their approach, which was very appreciated." We are very pleased with the job and give particular thanks to your installation team or Jay and Mitch, for their thoroughly professional and courteous approach to the work done. Please thank your guys for being efficient, clean and pleasant, I would certainly recommend them. If we were asked to recommend a company to install central heating we would have no hesitation whatsoever in recommending your company, it is nice to know that your company is giving young people a chance with apprenticeships to learn a trade in this day and age. Wish to thank you for the excellent young men you sent to sort out my central heating. They worked very hard and were very polite, carried out a splendid job. Your company is lucky to have them. We value your feedback. If you would like to leave us a comment, head over to our contact page. For a free survey or quote call us on 01702 619 698. Alternatively fill in the form below and we will call you back within 24 hours. AJR ECO Ltd are registered with all of the important accreditation organisations. AJR ECO Ltd help you secure your energy future by designing and installing Solar Photovoltaic (PV) systems, which generate clean and efficient electricity. 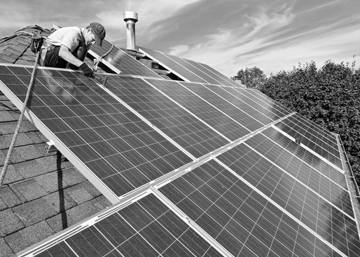 As an accredited installer and supplier of Solar PV systems we guarantee the highest level of service.